When I think about the Fourth of July, I see stars. Stars that light up the night sky as fireworks burst above. Stars on our flag, and the fifty states they represent. The heroic stars of our US military who fight for our freedom. 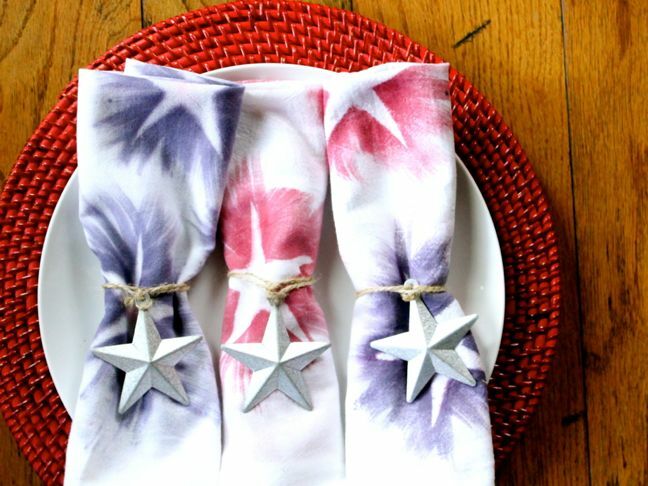 I wanted to add stars at my place setting when I sit down for our annual Fourth of July barbecue too, so I got a little star-happy with Rit fabric dye. Step 1: Lightly spray the napkin with water so it’s slightly damp. Note: I tried one napkin completely dry, and the other damp. I did not notice a difference in how each napkin turned out, so although this step comes highly recommended, it is optional. Step 2: Make sure you have five to ten star cut-outs made of card stock (I used my Silhouette electronic cutter to cut the stars for me), just in case they get soggy. Step 3: For the fabric dye, you will only need a small amount, so I revised the directions from the bottle. Inside an old mug, I used half a cup hot water, ½ tsp salt, and 1 tablespoon blue dye. For the red, I used 2 tablespoons red dye for a deeper red. Step 4: Protect the surface you’re working on with cardboard. Step 5: Place the napkin on the cardboard, and place the star(s) on the napkin. 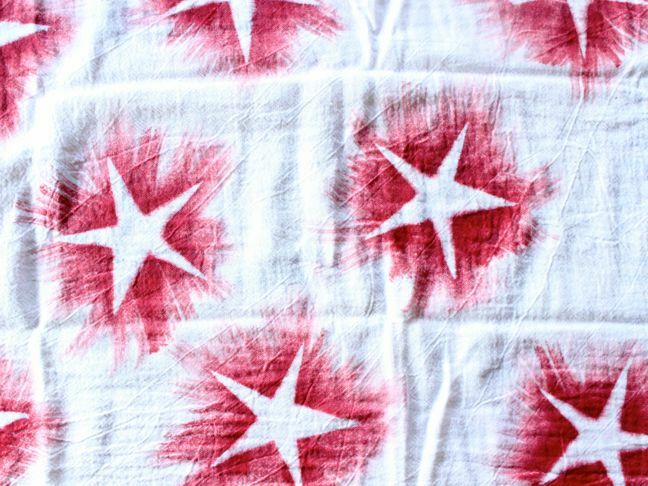 Step 6: Lightly dip your brush in the dye, and starting in the center of the star, move your brushstroke outward (toward the points of the star). 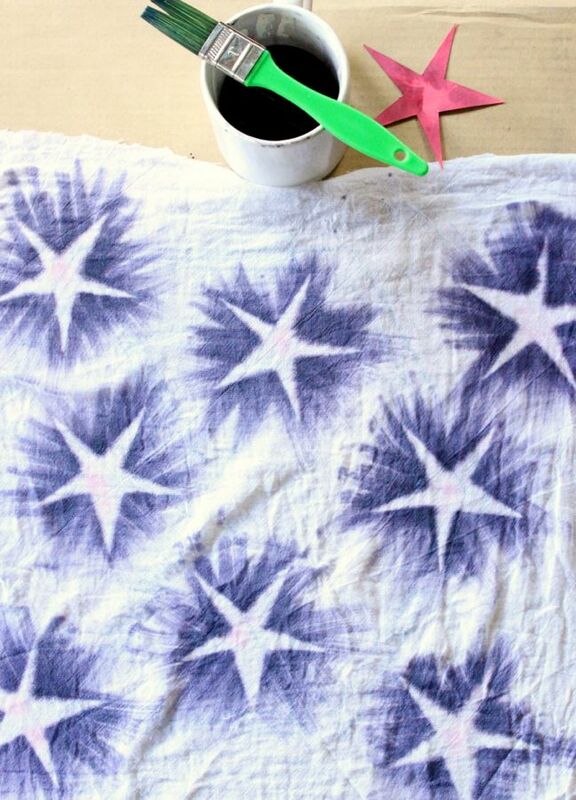 Repeat this step until all parts of the star have been covered with dye. 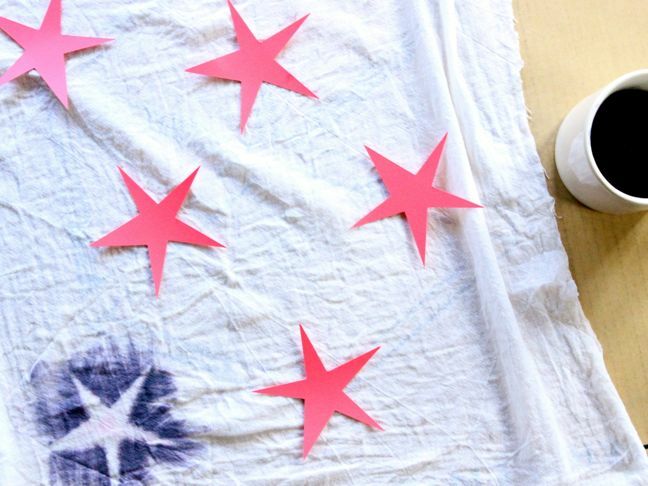 Step 7: Remove the paper star and repeat until you have all the stars you want on your napkin. Step 8: Follow washing instructions on the Rit container. Step 9: If you don’t want the tip of your fingers to turn red or blue, wear gloves. 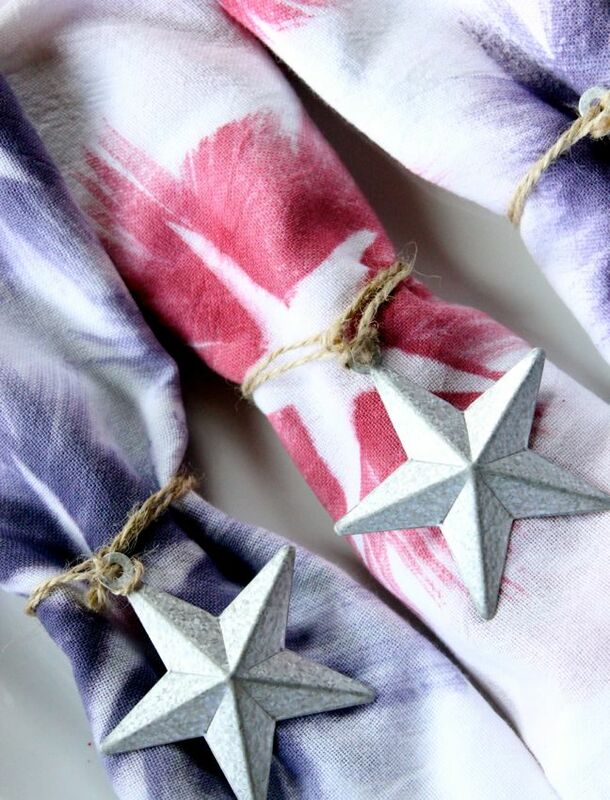 I hope you’ll be seeing stars this July Fourth, too!